Starting today, together with TeamSystem and BITSoftware, you will benefit from easy-to-integrate software solutions that you can offer to your customers. TeamSystem, European leader with more than 1.3 million clients and more than 650 partners, offers solutions and services of last generation for the digitalization of the companies, of every sector and dimension. BITSoftware Ltd, is one of the most important software companies in Romania, with over 25 years of experience in developing and implementing business software solutions (ERP, CRM, WMS and BI) and with successful projects in more than 70 countries. If you think you have these qualities and you want to live an important challenge with one of the biggest European players in the ITC sector, register below and discover the different possibilities of collaboration. Hurry up because this is a highly exclusive program with limited places! 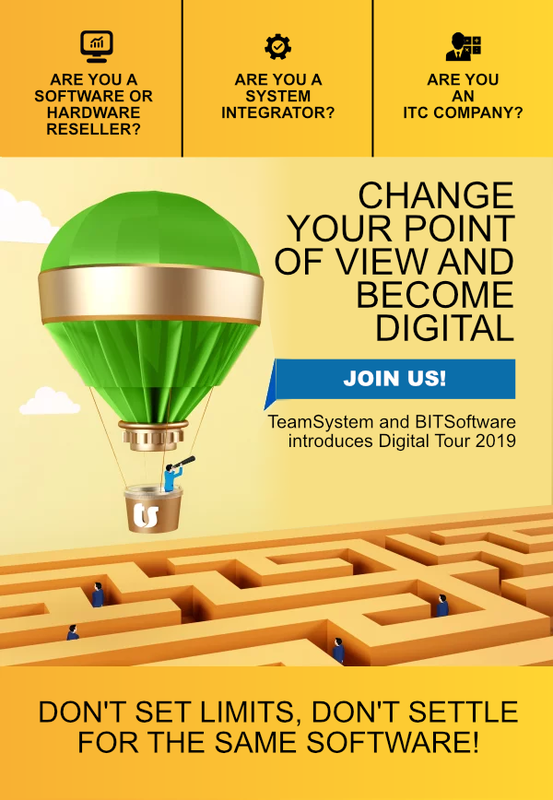 At the Digital Tour 2019 you will be able to learn more about the products, the strategy and the value proposition of TeamSystem and BITSoftware. Which are the benefits for our future partners?